Finely dice the shallots. Quarter the radicchio and slice or tear it into ribbons. Roughly chop the walnuts. Bring salted water to boil in a large pot. Cook pasta according to packet instructions or until al dente. Heat olive oil in a frying pan. Sauté the shallots until translucent. Add the walnuts and honey, and allow to caramelize and brown slightly over a medium-high heat for approx. 3 min. Add most of the radicchio and sauté for approx. 2 min. more. Deglaze with Calvados, white wine, and apple juice. Crumble in the Gorgonzola cheese. After it has melted, pour in the cream and season with salt, pepper, and freshly grated nutmeg. When the pasta is finished, strain, add to the sauce, and stir to combine. 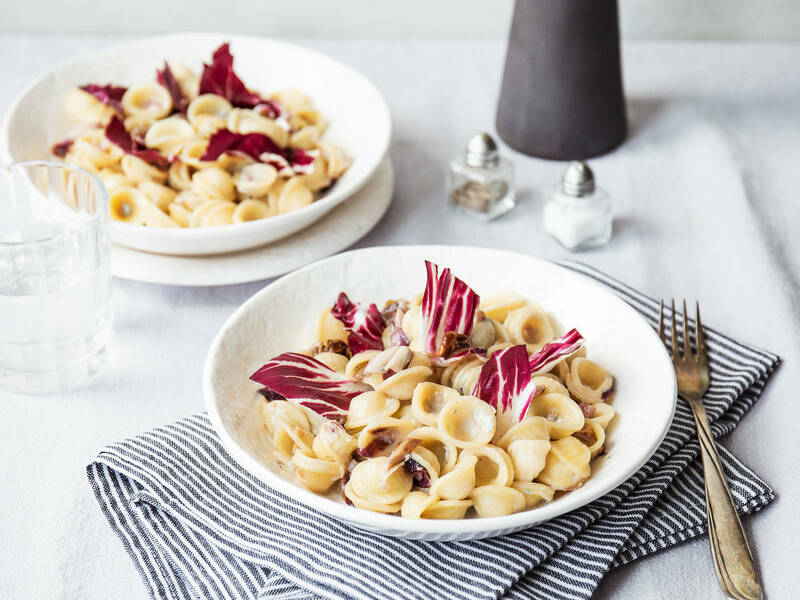 Serve and garnish with remaining radicchio. Enjoy!